Fog fluid is sold separately in quarts for $12.50 or gallons for $31.25. 1 quart of fog fluid will last for 30 minutes of continuous output but since the fog lingers in the air when used indoors you will not need to run the machine constantly to fill the room with fog. 1 Quart of our fog fluid could easily last 4 hours and keep an average size party room filled with fog. Please note that professional fog machines could set off smoke or fire alarms!!! 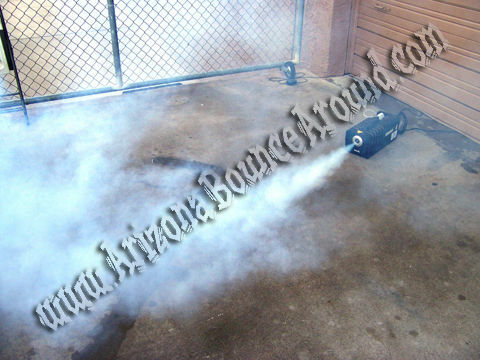 Our Fog Machine rental comes complete with a wired remote control and is a high volume fog machine suitable for larger indoor parties and covers up to 7062 cubic feet or 200 meters 3 with only 1 machine. It also works outdoors. Whether you want to fog up a dance floor or adding a little extra fog to your event, this fog machine will cover the area needed. Add some of our dance party lights to your fog machine for the perfect dance party. 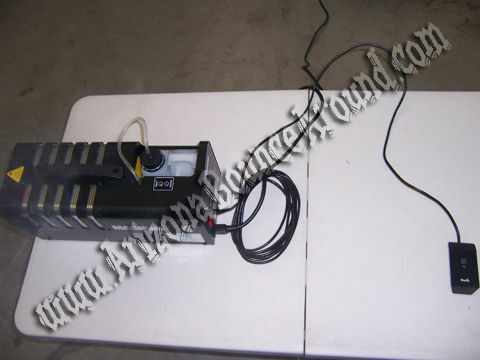 This fog machine can operate at angles from 45 degrees upwards or downwards and can be put on a tripod stand, on a table or on the floor. We can pair up to 2 machines on the same remote for super output. 2 machines will easily fill a full-size indoor basketball court. Rent a Professional Fog Machine in Denver, Colorado Springs, Aurora, Fort Collins, Lakewood, Thornton, Arvada, Centennial, Colorado today from Gravity Play Events for your next party.